LALAKING NAKAHULI NG “Monster Frog” SA TEXAS, NAG-VIRAL! 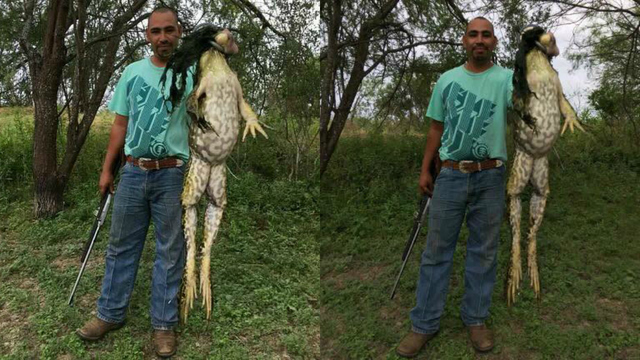 As indicated by the South Texas Hunting Association’s Facebook page, Markcuz Rangel is the man who caught the giant bullfrog which was gotten in a fishing pond in Batesville in south Texas. Meanwhile, a spokesman for the Texas Parks & Wildlife Department told the Houston Chronicle that the photo is real and not photoshopped. However, the spokesman said the picture is a little misleading. "It's not as bigly as it appears," spokesman Steve Lightfoot said. "[It's an] optical illusion created by extending frog toward the camera – similar to what you see with fishermen holding up fish to make them appear larger. Still a big bullfrog, though."